A logo that is cut into the waffle design matting makes this a crisp clean matting that looks stylish and creates a professional entrance to any business. The WaterGuard Logo Inlay mat is extremely durable and has rubber reinforced squares designed to make the mat crush proof. There are a variety of base colours to choose from to make a unique design and is suited to use in any way and is great for high foot traffic. This matting is great for recessed areas and has a Nitrile backing for maximum durability. 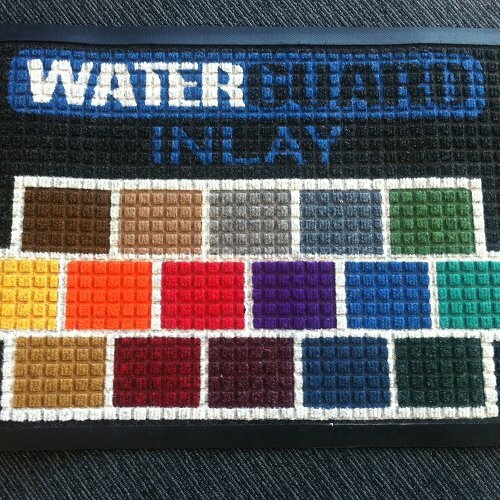 You can mix up to 5 colours per mat. A great mat that will remove dirt and debris from shoes before entering any area.